Zach King is known as a video magician who is in a league of his own. His digital tricks have been dazzling people around the world, gaining him millions of fans. It’s no wonder this video magician was drawn to Asheville, where you can find magical moments at nearly every turn. That’s just what Zach King discovered on his adventures in town. See for yourself by watching the video below! BONUS: See how young Zach King fans from Asheville reacted when we gave them a special sneak peek of Zach&apos;s video! Asheville has a personality, culture and vibe all its own. The "Paris of the South" is known for its unique outdoor cafes, local boutiques and cozy coffee shops. 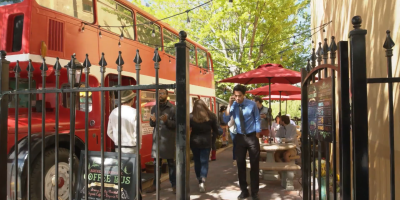 In the video, Zach begins his morning by ordering a cup of joe at Double D’s – a coffee shop inside of a red, double-decker bus anchored in the heart of downtown. Double D’s is a local and visitor favorite! Learn more about Double D’s and see our fans’ other favorite coffee shops for enjoying a delicious energy boost and reliable wi-fi. Just remember to tip your barista or server. If only we could all turn a cell phone photo into actual cash money like Zach does! See What Surprises Await You in Downtown! As Zach runs through Asheville, he shows us some of the landmarks you can explore on your next visit to bustling downtown. The first street we see Zach running on is Wall Street – a charming block lined with trees, cobble stones and red brick. 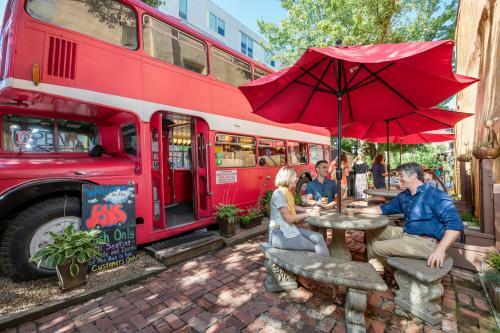 On Wall Street, you’ll find some of Asheville’s most popular restaurants including breakfast hot spot Early Girl Eatery, vegetarian-friendly Laughing Seed Cafe and local-ingredient-focused The Market Place. Wall Street is also home to a variety of eclectic local shops. As Zach first encounters the bicyclist, we see him run past the historic Flat Iron sculpture (which he magically turns into a helmet!). The giant laundry iron was designed by local artist Reed Todd, inspired by the irons that were used at the turn of the century at the Asheville Laundry. The sculpture sits just outside of the Flat Iron Building, an iconic wedge-shaped building built in 1926. It’s now home to businesses, shops and a rooftop bar, SkyBar, which offers stunning views. The Flat Iron sculpture is one of the best places to find street performers in Asheville. 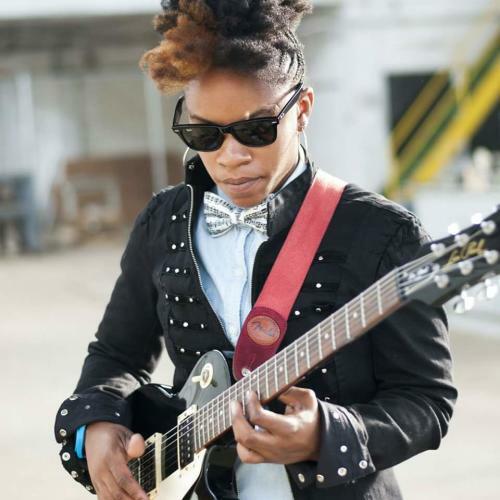 In the video, you’ll notice a performer, known as Lyric, playing the guitar. Lyric grew up in Asheville, began as a street performer and is now a touring artist. She still loves to perform in downtown Asheville! Read about her story and what she says makes the booming Asheville music scene so special. After hopping on the bike, Zach travels toward the U.S. Cellular Center and Thomas Wolfe Auditorium. This arena complex is home to Asheville’s largest venues and frequently plays host to special events, sports competitions and national and local performers. Later in the video, you’ll notice an aerial shot looking down at a series of bright red umbrellas. The umbrellas mark the outdoor dining at Carmel’s Kitchen and Bar, which serves up Southern-influenced comfort food. 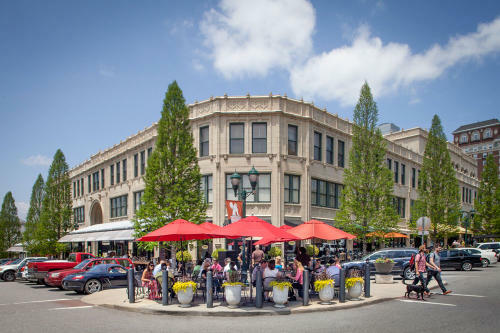 It&apos;s one of the 35 eateries, shops and businesses located at the historic Grove Arcade. The Grove Arcade is an architectural gem. Inside this architectural gem, find a symmetrical hall with a glass ceiling of skylights creating a quilt of geometric shadows. The photo possibilities are endless and it’s a great place to snap a shot that will help you grand slam your Instagram. Nearby the Grove Arcade, you&apos;ll find the Asheville Pinball Museum -- a great stop for family fun! Pay the admission and have access to more than 30 classic pinball machines for endless entertainment! You can get the birds-eye view (seen in the video) of the Grove Arcade and downtown from one of the city’s newest rooftops bars: Hemingway’s Cuba. Hemingway’s serves up flavorful Cuban-inspired plates. Hemingway&apos;s features outdoor seating and mountain views. Remember, the big purple bus Zach meets face-to-face? The LaZOOM Comedy Bus Tour is a fun way to experience Asheville. The tours introduce you to a series of characters who pop up along your journey. LaZoom has a special tour designed just for kids! The Kids&apos; Comedy Tour features a blend of Asheville history with kid-centric comedy that is geared toward children ages 5-12. As Zach and the bicyclist try to catch up with the coffee, you’ll see them “crash” in front of a brightly-colored mural. The mural, Bower Power, by Asheville artist Lara Nguyen is one of the many murals and public art pieces in Asheville, which known as one of the best places in the country for art lovers. Nguyen has a studio inside the building where the mural is located. In fact, the Refinery Creator Space is home to many artist studios and exhibitions presented by the Asheville Area Arts Council. The Refinery Creator Space is located in the South Slope Brewery District. 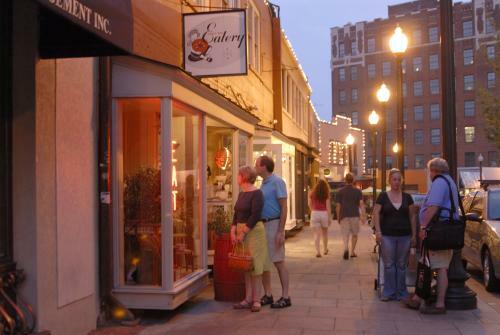 In addition to art and breweries, The South Slope is home to some of Asheville&apos;s most popular restaurants. Families will love Asheville Brewing Company with its big outdoor patio and games. Another district Zach visits is the River Arts District. 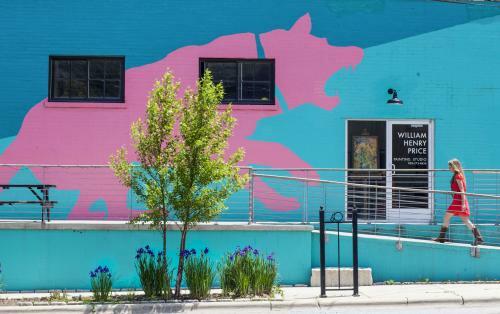 In the video, you’ll notice Zach running past a series of colorful buildings that make up Pink Dog Creative. The former textile manufacturing and warehouse building on Depot Street has been transformed into an exciting mix of businesses and artists studios. The River Arts District is home to nearly 200 artist studios in all where you can watch the artists at work and purchase a special souvenir! 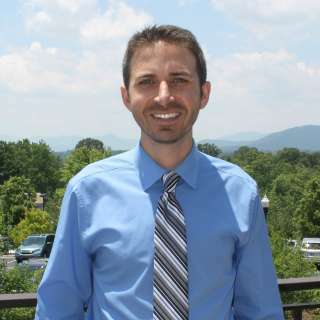 Zach tumbles his way to the Blue Ridge Parkway – one of the country’s most beloved scenic drives. The Blue Ridge Parkway winds around the highest and oldest peaks in the Eastern United States with hundreds of paved overlooks where you can stop for photos. 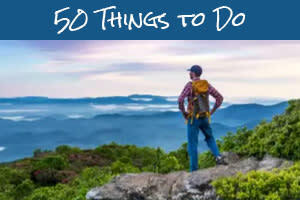 Multiple entrances to the Parkway are just 15 minutes from downtown Asheville. If Zach didn’t need to catch up with his boss’s coffee, he could have gone for a hike on one of the many trails that begin along the Parkway. You’ll find trails for all skill levels that you can hike to mountain vistas, waterfalls and lush green forests. 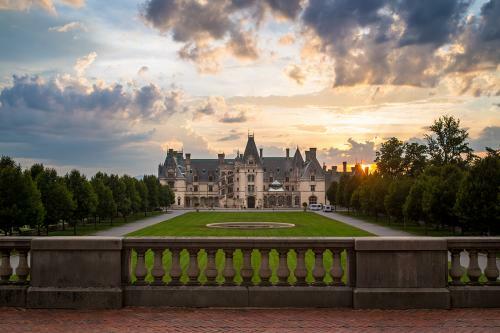 In the final scene of Zach’s video, we see him in front of Biltmore, America’s Largest Home. George Vanderbilt’s former home features 250 rooms, including 35 bedrooms and 43 bathrooms. In addition to the stunning architecture and detail you’ll see inside, stroll through the manicured gardens and grounds outside. As Zach mentions, there&apos;s no valet. But there is ample parking with shuttles that run from the parking lots to Biltmore house. After day of adventures in town (hopefully not as chaotic as Zach’s coffee adventure! 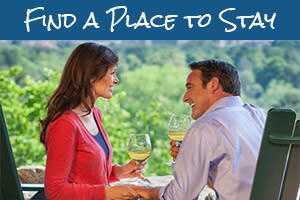 ), settle into one of Asheville’s many inviting accommodations. 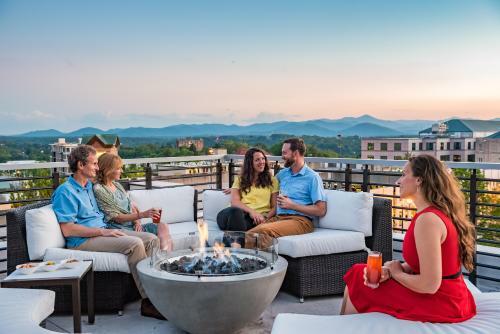 From hotels to cabin getaways to chic boutiques, Asheville is sure to have a place where you can rejuvenate and rest with your family before your next day of adventures! Photo credits: Double D&apos;s, buskers, Grove Arcade and Pink Dog Creative photos by Art Meripol. Hemingway&apos;s photo by C2 Photography. 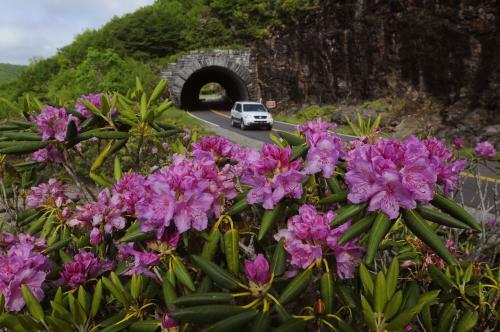 Blue Ridge Parkway photo by John Fletcher Jr. Biltmore photo by Jared Kay.